Interested in San Diego Beer Yoga? It seems like beer yoga is sweeping San Diego, America, and the entire world! This latest craze combines two of the most wonderful things in life, yoga and beer. Work off your calories and clear your mind, then drink those calories back without feeling guilty… and you’ll probably clear your mind even more with an ice cold pint of craft beer. 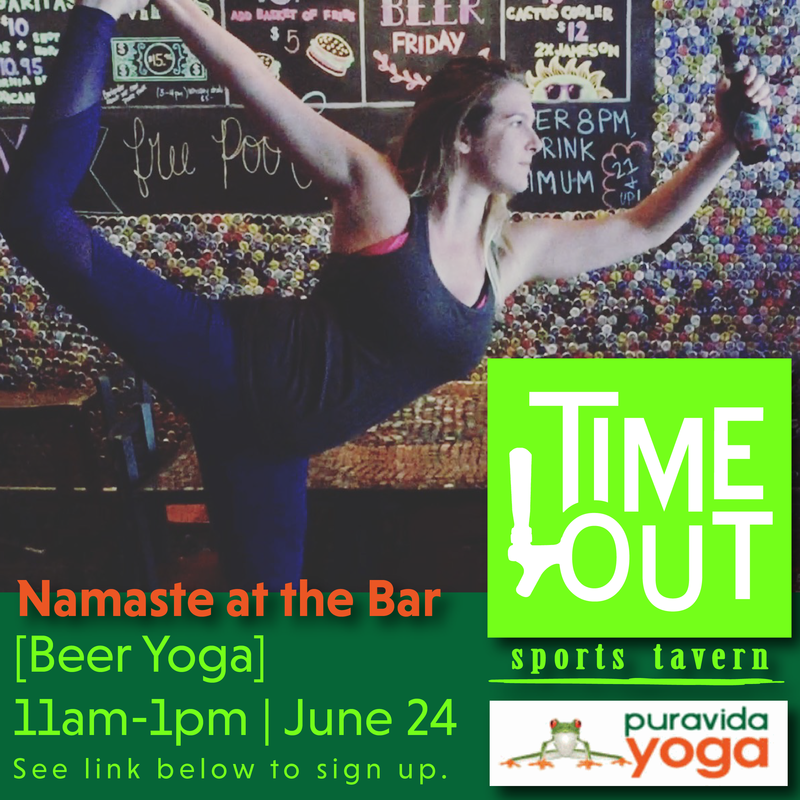 Because beer yoga is all the rage, Time Out Sports Tavern paired up with Pura Vida Yoga Center to host one of our best events yet, Namaste at the Bar. On Saturday June 24, our first beer yoga event at 11 o’clock am on June 24 takes place. Pura Vida Yoga is sending some of their amazing instructors and staff to the bar and will be teaching a yoga class for all levels. After class, stay for a while and have some more fun with your new yoga-loving, beer-drinking friends. And, your ticket includes one cold pint of craft beer. Whether you are a local or a tourist, this event is for you! Whether you are the best yogi in the world or have never done yoga before in your life, this event it for you! Because this is a super fun event combining meeting fun people, exercising, and drinking beer; you should be there! You can order your tickets online by clicking here. The cost is $15 for Pura Vida Yoga Members and $20 for the general public. Tickets include entry to participate in the yoga class and one free pint of craft beer. Want to learn more about beer yoga? Check out this article about beer yoga across the globe! Don’t miss out on all the fun! We look forward to seeing you at our event! Time: 11:00-12:15, then stay for more drinking and more fun afterward!